When you have a pile of wood that is not close to where you have your fire pit in your outdoor entertainment area, one of these Firewood Hauling Carts would go a long way to let you spend less time moving your wood. I have a wood pile in the far corner of my back yard, it is out of the way. Yet I do not want to set up my fire pit so far out, I just grab my log cart and off I go. I also have a fire place in my home, I don't want to load up a wagon and have to carry the wood in the house up the six steps a few at a time. I load up my log cart and it will go up the steps with ease with a full load. I am not a young person, I can still get a full load up the steps with out a lot of strain. If the lady of the house will let you, you can even leave the wood on the cart by the fireplace. Mine wants it in the rack by the fire place. 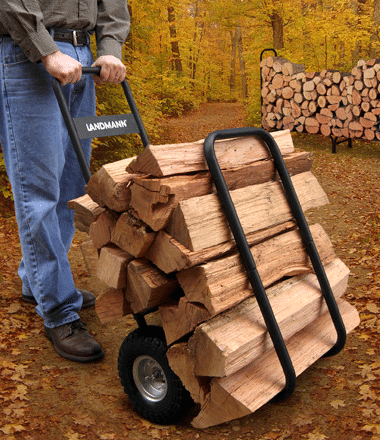 One of the best is the Landmann Firewood Log Carts. It is easy to assemble and just as easy to use. Follow along for my information on this firewood log carrier. When opening the box there are a lot of metal parts that need to be sorted before assembly. The 7 pieces of metal will go together to make the frame. The axle will go through the bottom of the frame to hold the two pneumatic wheels. The wheels are held onto the axle with two lock nuts and washers. The frame will be held together with the six bolts, washers and lock nuts. This log mover will carry enough wood to let you burn for an entire evening, if you don't burn all of the wood you can leave it on the cart. A poly cover is available for storing your wood on the cart for your next fire without having to unload each time. After looking over the instructions and I put out the parts in the order that I would need for assembly. Looking at the parts I determined that I would only need three tools to assemble, 13 mm wrench, 19 mm wrench and a big flat bladed screwdriver. I found out during assembly that a big rubber mallet would be needed also. The axle when through the two lower frame parts and attached with a washer and 19 mm lock nut on each side. The directions called for a washer and a cotter pin. The upgrade in my kit to the lock nut was a very good idea. The upper and lower frame parts are just pushed in and then held in place with a bracket and bolt, washer and 13 mm lock nut for each side. I found that I would need a little help to get them to set in place, so I used a rubber mallet to set them in place. After assembly I took it to the garage where my wood pile is at. I loaded a medium load for the first trip to the fireplace. I had to navigate 3 steps and 2 doorways. It was no harder to use than a regular two wheeler, but the extra frame will let you take a good load of wood from your wood storage area to your fire area. I tried the log caddy across a grassy area to my fire pit area in the back yard and the pneumatic wheels had no problem with the bumpy terrain. For more storage ideas for your fire wood, look at my post here. Can purchase a cover for protection when not in use. I would like to have a rubber bumper on the bottom of the front frame when you put it down after moving. This will keep you from leaving marks on the floor or scratching the paint off of the frame rail. If you have a wood storage area that is not next to your burn area, this will be a good addition to your tools when the weather gets cooler. You can wheel a good load of wood from your wood pile to an area inside your house or to an outdoor burn area. 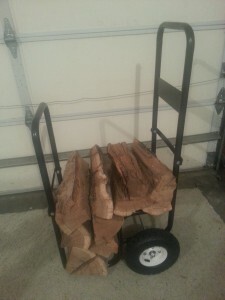 This Landmann firewood Hauling cart is a tool that will save you some time and your back. 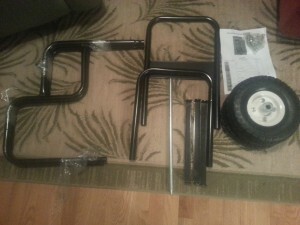 It is easy to assemble and can be ready to use in 15 minutes or less. While I had no parts missing there is a phone number on the packing slip to call if you have any trouble with missing or damaged parts. If you have a different tool to move your firewood or other ideas on firewood log carriers, leave me a comment below and I will get back to you. Great review of this product. Like the way you presented personal response after actually using the cart. I love the way you explain in details. Making it a breeze to understand everything we need to know about the product. Thanks for reading my article. If you need any more details on a log cart for your firewood let me know. Thanks for another great article. This little log carrier looks nifty and I like the idea of an easy and quick assembly. For sure my husband should be able to ‘swing’ it…and if not, I think I will be able to do it on my own. The firewood log cart will help with anyone that has to move wood from a wood pile to a burn area. I would not be without mine. Assembly took about 20 minutes without any trouble.